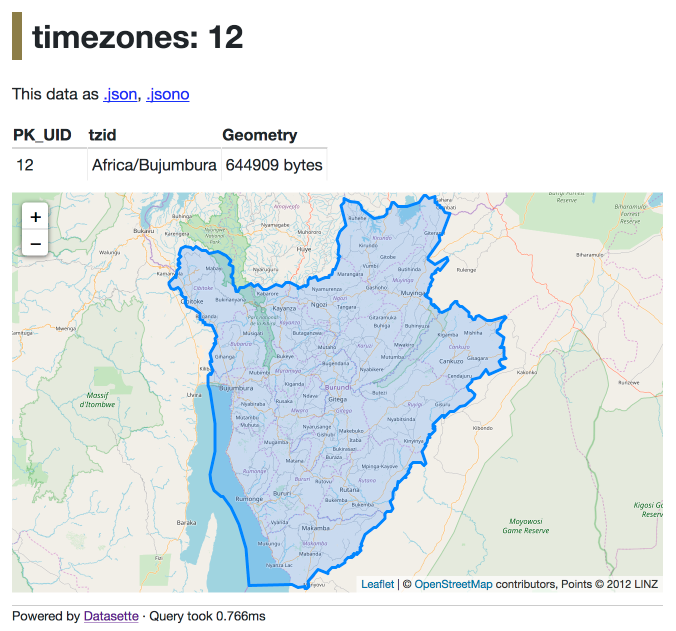 I was first introduced to Eric Muller’s tz_world shapefile by Nick Williams at Eventbrite, who used it to build us an internal time zone lookup API on top of MySQL’s geospatial data types. Eric’s project is no longer updated and he recommends Evan Siroky’s timezone-boundary-builder project as an alternative, which derives time zone shapes from OpenStreetMap and makes the resulting data available under the Open Database License. The shapefile itself can be downloaded from the GitHub releases page for the project. SpatiaLite is a powerful open source extension for SQLite, which adds a comprehensive suite of geospatial functions—including the ability to ingest shapefiles, convert them into geometries and run point within queries against the resulting shapes. That’s a tenth of a second, or 100ms. Fast, but not brilliant. How does this affect our performance? From 100ms down to 1.5ms—nearly a 70x speedup! Not bad at all. 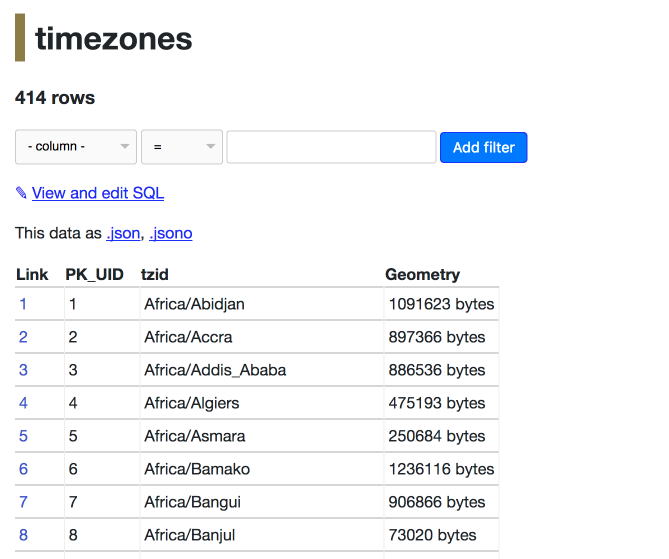 Now that we have a fast SQL query for finding a time zone for a latitude and longitude we can use Datasette to turn it into a JSON API. This works (click the JSON link to get the result as JSON) but it’s a little inconvenient to use: you have to construct a URL with the same latitude and longitude repeated in multiple places. If you paste this into Datasette it will detect the named parameters and turn them into URL querystring parameters hooked up (in thu UI) to HTML form fields. "by_point": "select tzid\nfrom\n    timezones\nwhere\n    within(GeomFromText('POINT(' || :longitude || ' ' || :latitude || ')'), timezones.Geometry)\n    and rowid in (\n        SELECT pkid FROM idx_timezones_Geometry\n        where xmin < :longitude\n        and xmax > :longitude\n        and ymin < :latitude\n        and ymax > :latitude\n    )"
The canned query is defined as the by_point key in the queries nested object. I’m also adding license and source information here for the project, because it’s good manners. Now visiting localhost:8001/timezones/by_point will provide the interface for the query—and adding .json to the URL will turn it into an API. If you browse around in Datasette you’ll quickly run into a rather unfortunate problem. The localhost:8001/timezones/timezones page, which shows the first 100 rows in the table, takes a shockingly long time to load. When it eventually does load you’ll see why: each record includes an enormous binary string containing its the geometry. On my machine just that one page weighs in at 62MB of HTML! This is bad: rendering that much HTML in one go can block the event loop and cause the application to become unresponsive. That giant blob of binary data isn’t exactly useful for humans, either. We can make some major improvements here using another Datasette 0.14 feature: custom templates. Let’s start with a replacement template that shows just the length of the binary string instead of attempting to render it. But wouldn’t it be neat if we could see the actual shapes of these time zones? It turns out that’s actually pretty easy, using the combination of GeoJSON and the Leaflet mapping library. If you run that with Datasette you’ll get back a string of GeoJSON. You can paste that into geojson.io to instantly visualize it. Normally we would use the datasette publish command to publish our database to Heroku or Zeit Now, but the SpatiaLite dependency means that won’t work for this case. Instead, we need to construct a custom Dockerfile that builds the SpatiaLite module. The full code, including the supporting templates, can be found in simonw/timezones-api on GitHub. Then you can visit http://localhost:8001/ to see your freshly built Datasette in your browser. The easiest way to publish it online is using Zeit Now. Simply run the now command in the directory containing the Dockerfile and Zeit will upload the entire directory, build the container in the cloud and deploy it with a fresh URL. It’s by far the easiest Docker deployment environment I’ve ever used. Hopefully this has helped illustrate the ease with which Datasette, SpatiaLite and canned queries can be used to create and publish geospatial APIs. Thanks to projects like OpenStreetMap the world is full of high quality open geospatial data. Go build something cool with it! This is Building a location to time zone API with SpatiaLite, OpenStreetMap and Datasette by Simon Willison, posted on 12th December 2017.